Freezing cookies saves time when you’re planning ahead or when you end up with lots of extras from a big batch. These tips make it easy to freeze them to use later. Q. Which cookies freeze best? Drop cookies, bar cookies, shortbread, sugar cookies, and biscotti. Q. Are there types of cookies I should not try to freeze? Meringues are tricky. They can absorb moisture when they thaw, leaving droplets of moisture on the surface. Cookies with thin, liquid batter, fried cookies, and cake-like cookies don’t freeze particularly well, either. Q. I’ve baked the cookies. Now what? Let the cookies cool completely before you prepare them for the freezer. Q. How do I freeze different types of cookies? Bar cookies: freeze them in slabs. Cut them after thawing. Drop cookies: freeze them flat with waxed paper, plastic wrap, or parchment paper in between layers. Frosted, decorated, or coated cookies: freeze them before decorating. Thaw cookies and then add icing and decorations. Jumbo cookies: wrap individually in plastic wrap. Freeze them flat. Take special note of freezing cookies with chocolate coatings: when thawing, they may develop a white-colored haze, known as sugar bloom. Moisture collects on the surface, draws out the sugar, and leaves behind crystals. Q. What containers should I use for storing cookies in the freezer? You can also use freezer bags, which are especially useful for bar cookies, but be careful where you set filled bags in the freezer. 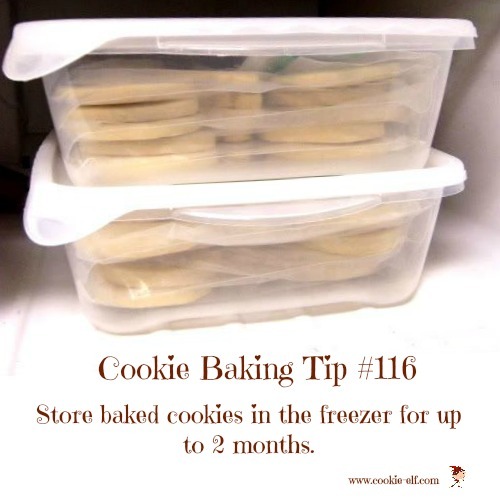 Keep in mind that plastic bags keep away freezer burn but don’t prevent cookies from breaking. That’s why The Elf does not use bags for freezing drop cookies. Make sure you label the containers or bags with the date! Q. How do I thaw the frozen cookies? Remove containers from the freezer. Take cookies out of the containers and let them sit on a wire rack or tray at room temperature. This way, condensation doesn't form and make them soggy. If you want a fresh-baked cookie taste and texture, you can reheat the cookies. Set them on a cookie sheet in a slow oven (250F) for 10 to 15 minutes. Q. How long can I store baked cookies in the freezer?